Cortera, a provider of comprehensive business-to-business payment and purchase behavior insights, had one goal in mind when they engaged Arketi: they wanted to generate several hundred new sales leads each month. To achieve this, the company’s CMO tasked Arketi with developing a “full-throttle” integrated marketing plan that would help him sell into an entirely new target market. And Arketi was up for the challenge. To get started, Arketi and Cortera brainstormed a plan of attack, which included public relations, paid search, and email marketing, and created a production schedule to coordinate each component. Arketi and Cortera considered messages and tactics that would educate, entice and engage prospects to help Cortera succeed – and reach its lead generation goal. With high expectations, Cortera and Arketi kicked off an all-out public relations blitz and worked with Cortera’s internal team to begin search marketing and aggressive email campaigns. Entering a new market meant that Cortera needed to educate an unfamiliar audience on 1) who Cortera is and 2) how the company could help its prospects increase their revenue. Public relations activities were specifically designed to do just that. Arketi targeted key publications, securing guest blog posts, contributed articles, editorial calendar opportunities and executive interviews that would educate sales and marketing professionals about Cortera’s solutions, which take customer prospecting out of the Stone Age and into the 21st century. 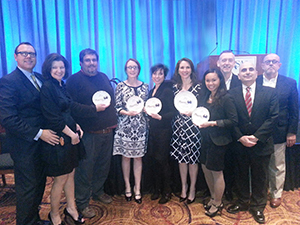 Team Arketi and clients went five for five, sweeping the award in every category entered at the 2013 PRSA|GA Phoenix Awards Celebration. Receiving five Phoenix Awards, Arketi earned top honors for BtoB marketing, BtoB media relations, social media, interactive design and research. Read more. A well-engineered and well-implemented automation platform has proven its value across thousands of companies, varying in size and sales models. To start maximizing your marketing automation investment, download this free issue of Arketi Insights. Arketi also launched a pay-per-click campaign to complement a multi-touch email campaign that Cortera was heading up. The paid campaign was designed to not only support Cortera’s various promotional offers, but also to help Cortera gain brand awareness against its larger and well-known competitors. With a limited search budget of $5,000 a month – compared to competitors spending four times as much – Arketi ran a highly targeted paid search campaign that focused specifically on users looking for Cortera’s exact offering. Tightly themed ad groups were created that directed users to very specific, relevant landing pages – which kept quality scores high and click-through rates high and consistent. A third prong of Cortera’s integrated marketing plan was an aggressive email marketing strategy. The email campaigns offered everything from free trials and beta testing opportunities to content downloads, including an eBook and a light-hearted infographic. Arketi designed all of Cortera’s email templates and landing pages based on industry standards and best practices, while incorporating Cortera’s branding and penchant for eye-catching images and bold colors. With an aggressive integrated marketing program firing on all cylinders, Cortera exceeded its lead generation goals. As a result of the PR outreach, Arketi secured 27 media placements consisting of thought leadership pieces and company-focused articles, reaching an audience of 1,589,655 in key publications such as DM News, Credit Today as well as recurring blog posts on CommPro.biz and DM Confidential. Cortera’s lead generation campaign is just one example of how marketing generates revenue. To see other client successes we’ve been delivering over the years, spend some time exploring the Results section of our website. After all, the numbers don’t lie! Arketi Principal Mike Neumeier, APR was honored as the 2013 Luminary Star Award by PRSA Georgia. This honor is presented annually to a member who is a seasoned professional that demonstrates outstanding leadership and contributions to the profession of public relations. Read more. During the three-month campaign, Cortera earned 76 conversions at a rate of $92 per conversion. The click-through rate averaged a consistent 1.01% and cost-per-click remained low at an average $2.32. Cortera and Arketi’s plan of attack proved just how much can be accomplished by planning and executing the right activities at the right time. Cortera educated its prospects while going head-to-head with more established competitors to achieve lead generation success. Thanks for reading Core. If you liked “Together, We Did It: How Arketi Client Cortera Generated a Firestorm of Leads,” please share it on Twitter. Or, if you’re interested in learning more about Arketi’s lead generation services, contact Sami Jajeh at sjajeh@arketi.com or 404-929-0091 ext. 202.